“Heading for some fun or other”. What a privilege it would have to have taken that forest walk with him. Brendano I like this a lot; it has a familiar feel, an easy gait and has that wonderful touching point between father and son. The last two lines move as a descant to the melody. Thank you very much, pg … I’m glad you like it. I have written quite a lot of rough material for poems on Sean; this is just a segment that I managed to get into reasonable shape. Forest Park is a housing estate in Virginia. 🙂 I used to drop him there quite a lot. And there’s me being all woody and evergreen! No doubt Forest Park was a jungle of life and laughter! I hope the Christmas service also gave you as much joy as I’m sure your choir’s singing did for the congregation. Hello Marya … thanks very much. Yes, that was the essence of Sean. The service went well. It was a mixed bag of instrumental music, songs by the choir and others, and poems and other readings. A lot of primary-school children were involved. I enjoyed it, and there was a good response from the congregation. I’m so glad that it went well .. there must have been some difficult moments but being among friends in such a warm and supportive community must have helped you all enormously. Thank you, Marya. Yes, the community is still very supportive. It was nice to talk to various people at the church. Pauline’s sister and her sons are with us at the moment, and we had a few friends over tonight. A good weekend. We got the Christmas tree up and decorated as well. Hello Brendano. We are in the process of trying to acquire a Christmas tree. Have just sent son out with some money – again. We usually put one up the weekend before Christmas, but there were none left in the city centre on Saturday. I am too lazy to take the car. Can’t bear the traffic. I hope that he will soon return, heaving a huge tree into the house. My elder daughter is coming home from Paris later this evening. Hello Cymbeline. Luckily we had bought ours a couple of weeks ago … there is now a shortage due to the difficulty of getting up mountain roads in the snow. We got a Nordmann fir, which I hadn’t heard of before. A nice tree. I hope your son will manage to acquire a good one. I’m sure you’re looking forward to having the family together for Christmas. Here it is -13 degrees, with no thaw expected before Christmas. Yes, I am looking forward to having everyone here for Christmas. Two guests from Martinique will be coming too. They are students in France, and their families can’t afford to fly them home for every holiday. I saw that Square Peg wrote a blog about Christmas tree decorations and all the family memories they hold. I thought of you and the memories you must have had while decorating the tree. There are certainly lots of Christmas memories. We brought the boxes of Christmas stuff down from the attic yesterday, and it upset Pauline when she saw Sean’s Christmas stocking. As I said before … everything has changed. One of the Martinique friends is the daughter of my Irish friend. I have mentioned my Irish friend in Martinique before. Her mother was the first female mayor in Ireland. It makes me terribly sad to think of your wife’s distress. That’s interesting … mayor of where, I wonder? I remember a woman was mayor of Limerick when I was a child; I think my sister made some kind of presentation to her … I have vague memories of a photograph. My mother thought she was the first woman in Ireland to have a mortgage in her own name … she was certainly one of the first. We’ve had a lot of visitors, and my sister-in-law and her sons have been staying, but they’re leaving today. I don’t remember where exactly, although I have been told. I think the family was from the West of Ireland. They moved to England, and my friend was born in England. She married into a prominent mulatto Martinican family of poets and lawyers, who wrote and fought against French colonial injustice. And the strangest thing of all is that I met her through a Welsh flag. We noticed a Welsh flag sticker on a car in Martinique. My daughter left a note under the windscreen wipers, with our address and telephone number written on it. The owner of the car telephoned us. In our telephone conversation, it transpired that we had both been to the same boarding school in Wales, twenty years apart. Extraordinary coincidence. This woman’s daughter has married into the same Martinican family. The last few Christmases were spent with that lot. Christmas tree has just entered the house, head first – FIFTY NINE EUROS. Good Lord, they were cheaper in the Caribbean. It says ‘Abies Nordmanniana’ on the label. Nordic mania more like. Anyway, we have a tree to decorate ready for daughter from the Sorbonne. I must try to enjoy my poetry of life too. Probably similar to ours, which cost €40. Yes, a good coincidence. It’s great to live in a space where you feel you can leave a note like that. In the popular mind, there are often negative connotations to the teenager wearing a hood. I have seen several photographs of your son wearing a hood. He takes on the hood, and makes it his own. The actor playing with an item of clothing. Charming others with sidelong glimpses and pretend hiddenness. Housing estates or forests – I suspect he wore his pixie hood in the same way wherever he went. Magical boy of charm. Thank you, Cymbeline. The photo here is a bit blurry, but I like it because of the way Sean is peering out of it … a characteristic expression of his. 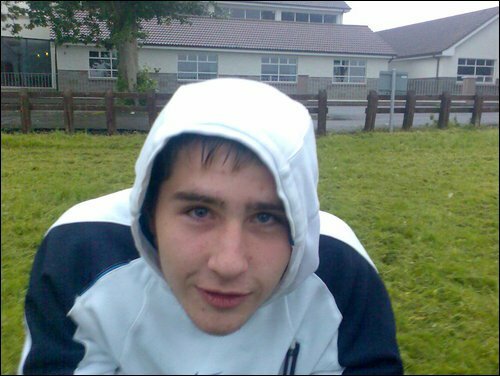 It was probably taken a few years ago … his old school is in the background. He liked to wear hoodies … in the months before he died he often wore the hood up even in the house. And yes … charming. I notice too, in all the photographs, that considerable care has gone into the cut of the fringe. Charming slightly dandy touch. A lovely boy. He used to wear gel in his hair, but grew out of that. I think he looked better without it. The woman who cut his hair (and mine) since he was in primary school told me that sometimes, if there was a lot of gel in his hair, he would ask her permission and wash it while he was was waiting for a haircut. That is true original style and brilliance. Never heard of that movement before. Love it. The hairdresser is also a good hairdresser. Tell her I said that, would you? The power of your poem lies in the way you give the ordinary names of real people and a real place. No artificial sylvan wanderings, although the housing estate name tries to do that! You then soar into the universal, taking the daily life with you. You know that the seemingly ordinary is poetry; you have always known that. Once again, I see that I am cluttering your commentators’ list. I do not like this, as I know that you like to receive comments from a range of people, especially from those who knew your son. Please understand the line in discretion that I have decided to adopt. It has nothing to do with larking around over Christmas, and nothing to do with not thinking about your family and your grief. Not clutter at all, Anna. It seems that quite a few people view my blog (over 300 hits today), but not many comment. Perhaps my mustard-coloured stamp puts them off. I also think that readers should comment. Common courtesy etc. They’re certainly welcome to if they wish. Hi Claire … that’s quite all right; it’s good to see you. How are things? Thanks, Claire … there are lots more that I will scan and post.